4090 Brookside Ave., called Upland View, was built in 1910 and was the home of Father Walter Henry Thomas. Father Thomas was a jokester and a magician and a minister. He was also a builder, and built several homes on Alabama Avenue. In 1928, Mr. Alexander of Alexander and Bradley, Surveyors, presented Thomas’s Rearrangement of Lots 3-6 on Brookside Block 8 to the Village Council, which gave a different configuration to the end of the block. In 1942 the Thomases moved to 4073 Alabama and rented out the large house, sealing his belongings in the second floor. Dr. John T. Casey (a dentist) and his wife Lorraine were listed at this address from 1942 to 1947. Casey’s office was at 3655 Joppa. During that time, the family must have taken in several renters or boarders, as several families were listed at the address in 1945 alone. This was a common practice for people with big houses during the Depression and the War. 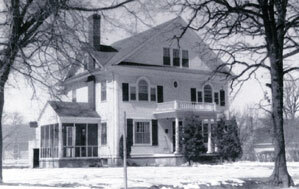 In about 1964, the house was bought by Duane L. “Duke” Sewall and his wife Pat. Duke sold insurance. Pat sold the house in 1997. It has remained remarkably the same throughout the years.